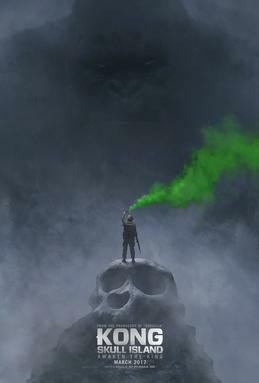 A: “Kong: Skull Island” will premiere March 10, 2017 on the big screen. This latest version of the action-adventure movie stars Tom Hiddleston (of “Thor” and “The Avengers” fame), Brie Larson (who won the Academy Award for Best Actress for “Room”), Samuel L. Jackson and Tom Wilkinson, and takes place in the 1970s, focusing on the origins of Kong. Hiddleston’s character, Capt. James Conrad, is the leader of an expedition venturing deep into an uncharted island in the Pacific Ocean, where you can bet they are going to run smack into everyone’s favorite giant gorilla. But if you can’t wait until March to get up close and personal with the mythical beast, you can head over to Skull Island yourself — that is, the one at Universal Studios Orlando Islands of Adventure. Its new ride, “Skull Island: Reign of Kong,” opened over the summer, and let me tell you that it is exhilarating and actually quite scary. It really does get you primed to want to see the movie. Here’s an insider’s tip: Try to sit as far on the right-hand side of the car as you can. A: The gorgeous and talented Oscar winner recently signed on to star as Olivia de Havilland in FX’s eight-part miniseries “Feud,” which centers on the bitter rivalry between “Whatever Happened to Baby Jane?” stars Bette Davis (Susan Sarandon) and Joan Crawford (Jessica Lange). The miniseries will premiere sometime next year, and co-stars Stanley Tucci as studio chief Jack Warner, Judy Davis as gossip columnist Hedda Hopper and Alfred Molina as director/producer Robert Aldrich. With a powerhouse cast like this, I can’t wait to see the series. A: Rob Thomas — creator of “Veronica Mars” and “iZombie” — is bringing the vampire cult classic to television over at the CW network. According to “Deadline,” the new series is being envisioned for a seven-season run, “spanning 70 years, each season chronicling a decade.” With each season, “the humans, the setting, the antagonist and the story all change — only the vampires, our Lost Boys, who are like the ‘Peter Pan’ characters who never grow up, remain the same.” There is no word yet on whether the vampires will be all-new characters or a reimaging of the movie- version ones, but seeing how they all died in the end, they’d have to get pretty creative if they are planning to reintroduce them.